La Jolla Village Drive at Genesee Avenue was reopened Thursday, one day ahead of schedule, when workers finished installing concrete girders above the intersection. SAN DIEGO (CNS) - La Jolla Village Drive at Genesee Avenue was reopened Thursday, one day ahead of schedule, when workers finished installing concrete girders above the intersection. 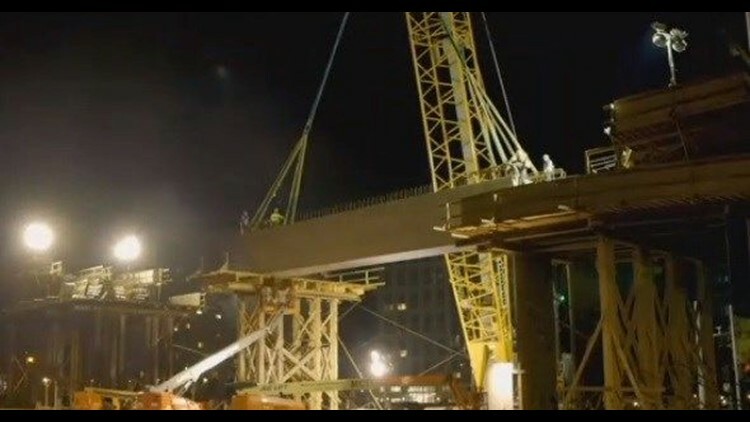 Construction crews began placing the four girders last Friday, each weighing 95 tons, and had expected to re-open the roadway tomorrow. According to the San Diego Association of Governments, the concrete set and hardened faster than expected, allowing crews to reopen the heavily traveled intersection to traffic this morning. The girder installation is part of the $2.17 billion Mid-Coast Trolley Blue Line Extension, which includes a planned 11-mile extension of trolley service by MTS from Santa Fe Depot in downtown San Diego to University City. The trolley will eventually run on the raised tracks where the girders were installed. The extension will add trolley stops in Mission Bay Park, UC San Diego and Westfield UTC. SANDAG received $1.04 billion in funding from the Federal Transit Administration to complete the project.